Get perfectly sculpted brows with Annabelle! This retractable micro-pencil allows a precise application and a natural look. Its formula is matte, rich and easy to blend. Includes a brow-shaping comb easy to use. Waterproof and super longwear. Hypo-Allergenic. I had high hopes after reading the reviews. Sadly this did not work at all for me. I have no eyebrows, so I use makeup to create them and have tried many, many products through the years. This product would not even make a mark on my skin, so I guess it only works if you have some eyebrows to start. Very disappointing. My favourite brow liner. Easy to apply and looks natural. My favourite brow product! I have blonde hair and it is hard to find the right colour for brow pencils but universal light is perfect for me. Way better than Anastasia brow pencils in my opinion (and way cheaper). I thought I loved the Marcelle fine eyebrow pencil that I used to get, but this one tops it by a mile and is less expensive to boot! I use Universal Medium, and it looks great. Goes on so easily - no mean feat with someone whose eyebrows are getting very sparse. All I hope is that they don't discontinue this product, which is sometimes the case when I find something so perfect. Highly recommend!! Works great, the end doesn`t break off easil;y like some pencils do and I love the color - Universal Dark and the price. I've been looking for something to replace a favourite that got discontinued and I've found it. Not warm and doesn't pull red on my brows, good lasting power. Although this can look a little patchy after a bit so set with a powder, or brow gel. Great product I always struggle with my eye brows but I love this!!! Very precise and applies nice! Would buy again!! I love this product!!! I have been using this product for about 3 years and can not live without it. I use the universal dark colour. I have an olive/tan skin tone with dark brown hair! (For Reference) This product lasts from morning to night, and the brows do not fade or smudge one bit. And to add to the amazing product it upholds the most oily skin!!! I will be devastated if this product ever was discontinued! I love this product! I have blonde, curly eyebrows that will grow forever if I don't trim them. Parts of my eyebrows have colour, and parts are so blonde as to be invisible. The little brush is terrific, and the wax helps keep everything in place. 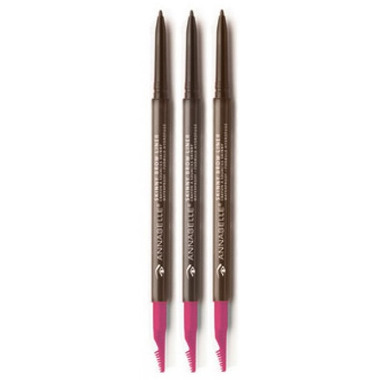 The colour is natural, and my brows look soft and natural when I fill them in with this wax-pencil. I used to use the Mac version, and before that the Clarins version, but they both discontinued their wax colour pencil. Hooray for Annabelle! I hope they carry this product till the end of time. It is excellent.